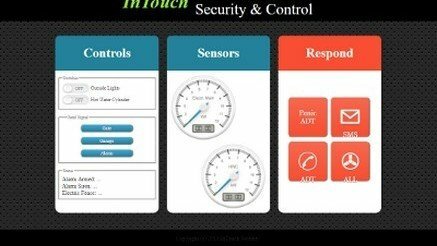 I am an electrical engineer and I have developed a solution to remotely control electrical circuits at our self catering guesthouse, Umoya Cottages in Port Elizabeth. Even when we are not at home, we can securely log in over the internet to switch on lights, geysers and even open the motor gate. In combination with the CCTV over the parking lot, I can for example open the gate for a guest and switch on the external lights, even if I am overseas. All I require is an internet connection and it is as good as if I am back home. And the best part, the whole setup cost me less than R1500 ($130). I am willing to share my code and sketches for free. All I ask in return is to like and share my website on Facebook. It is simple, merely click all the social media buttons below, and email me a screengrab to guillaume.de.s@gmail.com and I will reply with the code. But please share and like. This setup has come in very handy in various forms. For example I have received deliveries of materials a few times while I was away from the guesthouse. Sitting in front of my work computer at my office, I can open the gate remotely from my office and watch the delivery guys drop the material off in the right place. I can watch the activity and open the gate for them to leave when they have finished. All this over the internet. I can even use a friend’s phone or computer at an internet cafe, as long as it has an internet connection. The setup adds extra security and flexibility for self catering accommodation owners or homeowners. The solution is based on programming the wonderful Arduino microcontroller with a stylish and secure webserver. The microcontroller costs around R400 ($30). An unbeatable price compared with any other home control solution out there! The concept has been tested and it is working great. I am using it to remotely open my electric motor gate and switch external lights for my guest house. The plan is to create a commercial product that will include a cross platform smartphone app. However creating a stable, thoroughly tested commercially viable product takes a lot of time and/or money. Currently I do not have too much of either to spare, especially time. So this project is on the back burners. After uploading my demonstration unto youtube, I have been bombarded with emails requesting the Arduino sketch. I have finally decided to share this sketch on my blog. By sharing the code, maybe I can attract interested investors for the commercial product or attract other programmers who would like to help me develop the product further. There are two sections of code involved. The Arduino sketch sets up the network and handles the communications. The sketch then calls a .htm webpage stored on the SD card and communicates this one line at a time over the internet, acting as a web server. I am sharing my software code and sketches for absolutely free. But be warned, you will need some serious programming skills to understand and implement the software. It is not a plug and play solution. If you have the time, patience and passion to learn the programming languages required to understand and create such setups, I suggest using the following resources to educate yourself with programming. If you like how I have set up our Umoya Self Catering Cottages, please share this page on facebook and like our facebook page.